This innovative product has all the advantages of a traditional dryer sheet, without all the unwanted chemicals! 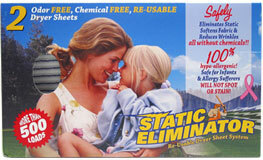 The Static Eliminator Dryer Sheet eliminates static, softens fabric, and reduces wrinkles in your dryer load without leaving chemical residue on your family’s clothing or reducing the clothing’s flame resistance. These dryer sheets are 100% hypoallergenic, gentle on children’s clothes, and won’t stain even the most delicate of fabrics. These sheets will soften over 500 loads of laundry naturally! Each box of 2 reusable sheets is $12.99. From Christina Ignacio of Emeryville, California on 2/24/2009 . Finally, a 'dryer sheet' that is cruelty-free and actually works! You get two, tubular-shaped pieces of cloth in the package. As long as you follow the care instructions, I don't see why it won't work for you! We've done a few months worth of laundry on one (two in our house, plus three cats - you know how that goes) and it's still going strong. From Molly Lorenz of Sheboygan, Wisconsin on 9/14/2008 . I've been using these for the last several weeks and haven't had any static in my laundry like I usually do. I love that they're reusable, making them eco-friendly. Definitely a keeper!